Mass Spectrometry of Inorganic and Organometallic Compounds will inspire the synthetic inorganic and organometallic chemist with the confidence to apply some of the new techniques to their characterization problems. William Henderson is the author of Mass Spectrometry of Inorganic and Organometallic Compounds: Tools - Techniques - Tips, published by Wiley. 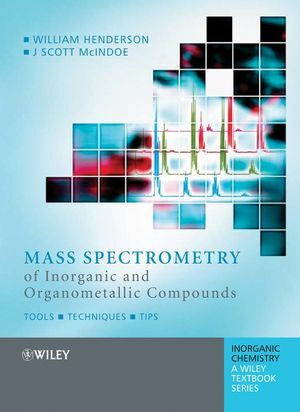 J. Scott McIndoe is the author of Mass Spectrometry of Inorganic and Organometallic Compounds: Tools - Techniques - Tips, published by Wiley. 2.6 Fourier Transform Ion Cyclotron Resonance. 3.4 Field ionisation / Field desorption. 3.6 Fast Atom Bombardment / Liquid Secondary Ion Mass Spectrometry. 3.7 Matrix Assisted Laser Desorption Ionisation. 3.8 Inductively Coupled Plasma Mass Spectrometry. 4. The ESI MS behaviour of simple inorganic compounds. 4.3 Polyanions formed by main group elements. 4.4 Oxoanions formed by main group elements. 4.7 Inorganic phosphorus compounds: phosphoranes and cyclophosphazenes. 5. The ESI MS behaviour of coordination complexes. 5.2 Charged, "simple" coordination complexes. 5.3 (Neutral) metal halide coordination complexes. 5.4 Metal complexes of polydentate oxygen donor ligands: polyethers, crown ethers, cryptands and calixarenes. 5.6 Metal alkoxides – highly moisture-sensitive coordination compounds. 5.8 Metal complexes of carbohydrates. 5.9 Metal complexes of amino acids, peptides and proteins. 5.10 Oxoanions, polyoxoanions and related species. 5.12 Compounds with anionic sulfur and selenium donor ligands. 5.13 Characterisation of metal-based anticancer drugs, their reaction products and metabolites. 5.14 In situ formation of coordination complexes as an ionisation technique. 6. The ESI MS behaviour of main group organometallic compounds. 6.2 Organometallic derivatives of group 14 elements. 6.3 Organometallic derivatives of group 15 elements. 6.4 Organometallic derivatives of group 16 elements; organo-sulfur, -selenium and -tellurium compounds. 7. The ESI MS behaviour of transition metal and lanthanide organometallic compounds. 7.4 Metal cyclopentadienyl and related complexes. 7.7 Formation of p-hydrocarbon complexes and their use as an ionisation aid. 7.8 Metal-acetylene/acetylide complexes, and complexes of metal-acetylides. 7.9 Transition metal s-alkyl and aryl complexes. 7.10 Mass spectrometry of lanthanide organometallic complexes. 8. A selection of special topics. 8.2 Characterisation of dendrimers using ESI and MALDI–TOF MS techniques. 8.3 Investigating the formation of supramolecular coordination assemblies using ESI MS.
8.4 Using ESI MS as a tool for directing chemical synthesis: A case studyinvolving the platinum metalloligands [Pt2(m–E)2(PPh3)4] (E = S, Se). 8.5 Applications of ESI MS in the detection of reactive intermediates and catalyst screening. Appendix 1: Naturally occurring isotopes. Appendix 2: Periodic table of the elements. Appendix 3: Alphabetical list of elements. Appendix 4: Glossary of Terms. Appendix 5: Useful sources of information. Suggests ionization techniques for just about any given compound.